To track the time spent (and any additional information about the appointment), with a customer that hasn't resulted in an immediate sale, you can create what we refer to as a Call Note or Contact Log entry.Call notes are a great way to add information to a customer's profile and have the ability to refer back to easily. You can pull reports, track your time, etc. Get creative! 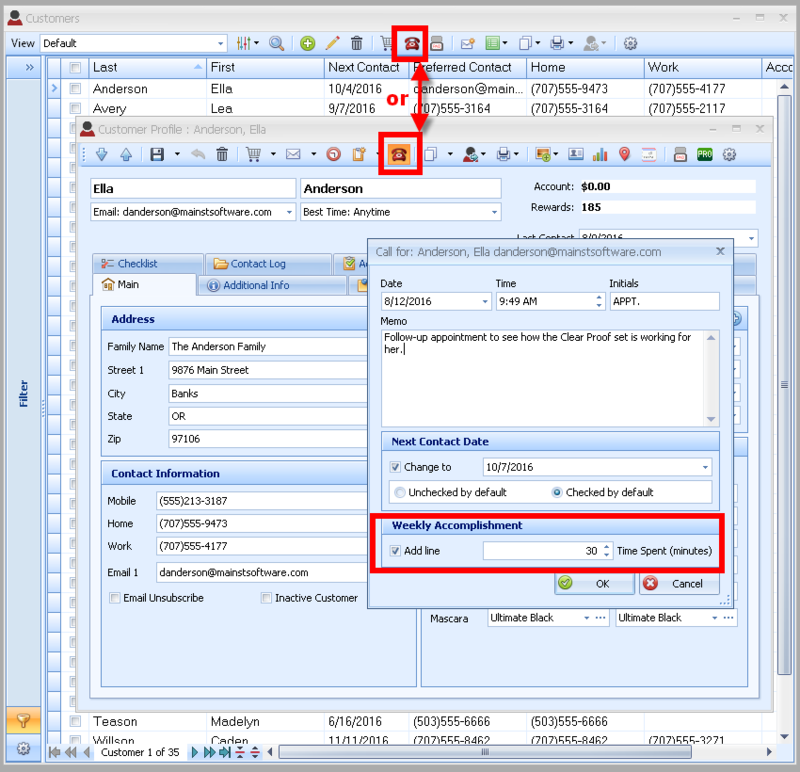 (See View Calls & Email Entries from the Contact Log to view entries for all contacts during your desired date range). From the customer list, or customer profile tool bar click . Enter applicable information into the Date, Time and Initials fields. Customizing Tip: If you're the only one that works in your office, instead of using your initials enter APPT. in the Initials field to specify that the entry is related to an appointment. Under the Next Contact Date section, choose whether to move their Next Contact Date to a future date in the Calendar by selecting the Change to check box. Under the Weekly Accomplishment section, select the Add line check box and enter the amount of Time Spent (in minutes).